Tonga’s Deputy Prime Minister Siaosi Sovaleni says it’s significant for the Ministry of Revenue and Customs to work collaboratively with related stakeholders to collect information to protect our borders. DPM Sovalevi says we are living in a rapid moving world and globalization and movement of people is a challenge for small island states like Tonga where illegal activities are on the rise. Radio Tonga reports this is due to lack of capabilities and funding for expertise and sufficient resources. Government this year will start with its E- project to collect information and share it with related partners with the purpose to protect our nation and borders. “... Although there are set back, data analysis lack of skill and resources, lack of ideal infrastructure and proper privacy laws,” he said. The Government has identified data analysis as strategic objective. Mr Sovaleni says government is planning to start by building appropriate infrastructure from July of this year they are going to start an e- government project that will undertake some activities including, connecting Ha’apai and Vava’u with fiber optic cable. “Connecting sides not only in Tongatapu but in Vava’u and Ha’apai using fiber optic cables and this will enable you to share huge amount of data quite easily,” he said. Minister of Revenue Tevita Lavemaau says a clear example of lack of resources was the Georgians case last year, when it was identified from overseas not in Tonga when they arrived. “…Its everybody’s obligation to protect our border its not only the Ministry its everybody as a citizen has a role to play. Information system is a tool in management in today’s environment and we have the challenge of having too much information we don’t analyze it, unless we analyze it, it doesn’t become useful for management, “ he said. 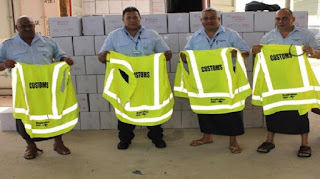 CEO of the Ministry said though Tonga does not have the right resources needed for its daily operation but the Ministry has exceeded its financial estimate target this year with TOP$4.1 million.